Not your typical pizza franchise owner, the man behind the Straw Hat Pizza on Kiefer Boulevard is committed to his customers and to the community. 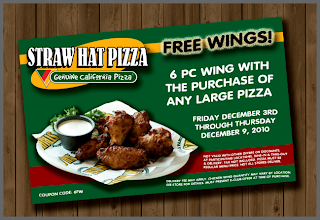 When most people think of Straw Hat Pizza, they think only of pizza, breadsticks and maybe even hot wings. But that's not so for some Rosemont residents who have come to know the Straw Hat Pizza on Kiefer Boulevard for more than just the food. A staple of the Rosemont community for about 20 years, the franchise pizza place is filled with good food and good memories for some. Owner and operator Masoud Soudani, a native of Iran, had always dreamed about coming to America as a child. After obtaining a degree for refrigeration and air conditioning in India, opportunity knocked and, 28 years ago, Soudani moved to Sacramento, a city that he said was much like the one he was born in, and found a job as a dishwasher. "When I came here, like other immigrants when they come here, they are stuck in pizza delivery and dishwashing and this and that, so I started that," he said. Soudani moved up into the ranks, becoming the owner of his own franchise about 10 years later. Putting his life into his work, Soudani hadn't had a chance to start a family until the age of 47, when his now 3-year-old son was born. He said he loves his job and loves putting smiles on his customers' faces. "It's not about the money–I have the money," Soudani said. "It's about the love. When customers come in and I see the smile on their face, that is my tip. That is my money." And Soudani has gained an extended family from his restaurant. He's been invited to the gatherings of many of his loyal customers, from birthday parties and marriages to funerals. The same day the Sept. 11, 2001, attacks happened, Soudani received an outpouring of support from his customers. "They came here and said, 'not to worry, Masoud, if anybody comes here to bother you, just say nothing and get the license number of their car and we'll take care of them,'" he explained. But Soudani is not just involved in his customers' lives—he's also involved in the Rosemont community as a whole. He lamented the fact that the community had changed, that it doesn't seem as strong as it once was. "Community is family," he said. "And this family is not as strong as before. We have to make it as strong." Soudani has decided to do his part and attend the next monthly Rosemont Community Association meeting to discuss things that could be done to make the community stronger. In the meantime, you can find him in the kitchen or behind the counter at Straw Hat Pizza, treating every customer who walks through the door like family. Not valid with other discounts or offers. Dine-in and take-out only. At participating locations. Tax not included. Some locations serve 14" large pizza. We are proud to announce a new Straw Hat Pizza restaurant will be opening soon in Belvidere, IL. Stay tuned for more information. 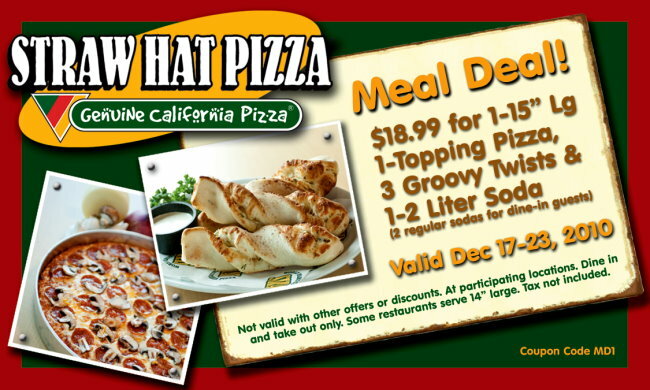 December 2010 launches the "King Size Pepperoni Pizza for $11.99" special. Straw Hat Restaurants Inc., a 65-unit pizza chain, is showcasing a new design at a franchised unit that opened Thursday in Flower Mound, Texas. The Texas unit covers 3,900 square feet and features two wall murals that depict the 51-year-old pizza brand’s history and its California heritage. It also features a bar area, private dining for 40, video games, a 42-item salad bar, pizza lunch buffet and televisions in booths. Straw Hat officials said the new look design will be featured in future stores. Earlier this year, Straw Hat unveiled a new frozen-yogurt concept called Tower 27, which is designed to be co-branded with the chain's pizza restaurants. In addition to its first unit in Texas, Straw Hat has locations in Arkansas, California, Montana, Nevada, New Jersey and Oregon. It has scheduled openings in Arizona and Florida as well. 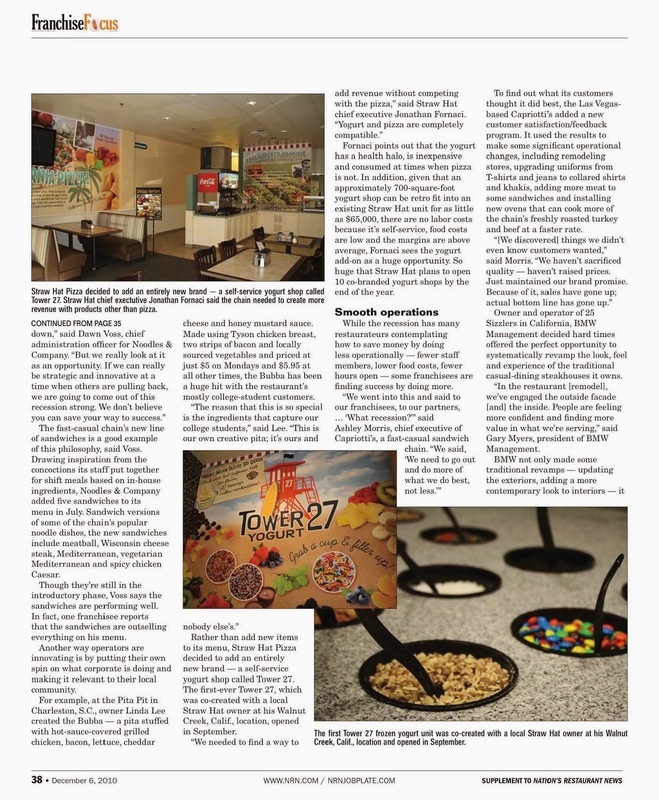 Tower 27 Yogurt Highlighted in the "Franchise Focus" Section Of "Nation's Restaurant News"
Rather than add new items to its menu, Straw Hat Pizza decided to add an entirely new brand--a self-service yogurt shop called Tower 27. The first-ever Tower 27, which was co-created with a local Straw Hat owner at his Walnut Creek, California location opened in September . "We needed to find a way to add revenue without competing with the pizza," said Straw Hat chief executive Jonathan Fornaci. "Yogurt and pizza are completely compatible." Fornaci points out that the yogurt has a health halo, is inexpensive and consumed at times when pizza is not. In addition, given that an approximately 700-square-foot yogurt shop can be retro fit into an existing Straw Hat unit for as little as $65,000, there are no labor costs because it's self-service, food costs are low and the margins are above average, Fornaci sees the yogurt add-on as a huge opportunity. So huge that Straw Hat plans to open 10 co-branded yogurt shops by the end of the year. 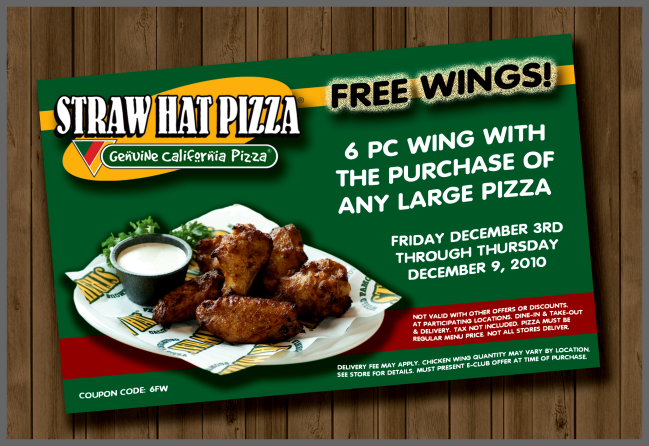 Free 6 pc wing with any large pizza. Good through Friday 12/3/10 through Thursday 12/9/10. At participating locations. Dine-in, take-out or delivery. Not all locations deliver. Not valid with other offers or discounts. Minimum delivery charge applies. Tax not included. this e-Club offer at time of purchase. See store for details. We're proud to announce that Straw Hat Pizza is one of the top 50 franchises for minorities by the National Minority Franchising Initiative / World Franchising Network (NMFI).